Manipur Chief Minister N Biren Singh on Sunday announced that almost all necessary procedures for the launch of Flying Doctors (air ambulance) project in the State has already been completed. Chief Minister Biren was sharing the information about the flying doctors while distributing around 1400 cards/benefits of different flagship programmes initiated under the supervision of Prime Minister Narendra Modi during a function at Chingamakha Model Club ground under Singjamei constituency in Manipur’s Imphal West District. State Governor Dr Najma Heptulla had been initiating the flying doctor project since the last two years to make this medical outreach in the rural and hill areas of the State a reality. Biren said that the State Government has been constantly putting in efforts to bring a developmental change in the State. He said that understanding the basic requirements of the masses and to fulfill it within a stipulated period is the key priority of the present Government. Informing that the state government has been able not only in delivering governance at people’s doorsteps but also understanding their woes through ‘Go to Village’ mission, he said that almost all the census villages of the State had been covered in the first phase of the mission so far. 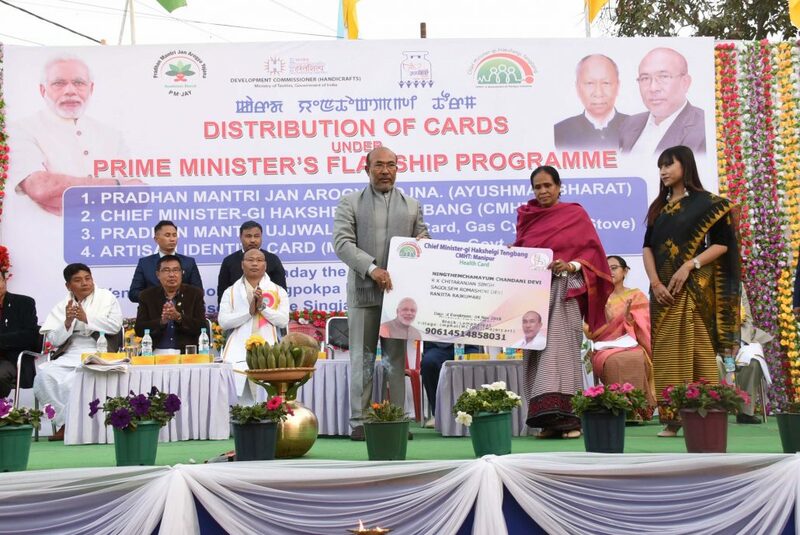 A large number of people have been provided Chief Ministergi Hakselgi Tengbang and Ayushman Bharat cards which ensure free treatment in empanelled government and private hospitals, he said. To give renewed thrust towards improvement of Government schools both in terms of physical and manpower infrastructure besides aiming to give modern quality education to children free of cost at model schools, he said state Government has launched ‘School Fagathansi’ mission. In his speech Manipur Assembly Speaker Y Khemchand said that positive changes would be visible if the social environment is clean. He urged the public to extend support in bringing about a new change in the State as well as in Singjamei constituency.